Since the 1986 discovery of high-temperature superconductivity in copper-oxide compounds called cuprates, scientists have been trying to understand how these materials can conduct electricity without resistance at temperatures hundreds of degrees above the ultra-chilled temperatures required by conventional superconductors. Finding the mechanism behind this exotic behavior may pave the way for engineering materials that become superconducting at room temperature. Such a capability could enable lossless power grids, more affordable magnetically levitated transit systems, and powerful supercomputers, and change the way energy is produced, transmitted, and used globally. 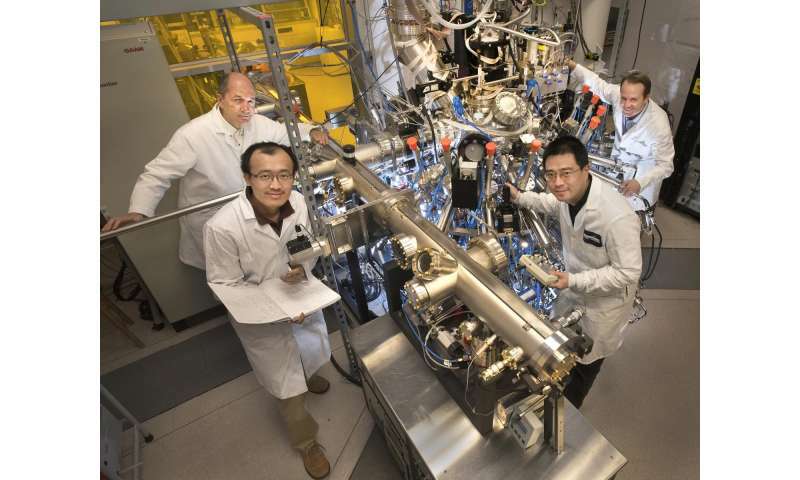 Now, physicists at the U.S. Department of Energy's (DOE) Brookhaven National Laboratory have an explanation for why the temperature at which cuprates become superconducting is so high. After growing and analyzing thousands of samples of a cuprate known as LSCO for the four elements it contains (lanthanum, strontium, copper, and oxygen), they determined that this "critical" temperature is controlled by the density of electron pairs—the number of electron pairs per unit area. This finding, described in a Nature paper published August 17, challenges the standard theory of superconductivity, which proposes that the critical temperature depends instead on the strength of the electron pairing interaction. "Solving the enigma of high-temperature superconductivity has been the focus of condensed matter physics for more than 30 years," said Ivan Bozovic, a senior physicist in Brookhaven Lab's Condensed Matter Physics and Materials Science Department who led the study. "Our experimental finding provides a basis for explaining the origin of high-temperature superconductivity in the cuprates—a basis that calls for an entirely new theoretical framework." According to Bozovic, one of the reasons cuprates have been so difficult to study is because of the precise engineering required to generate perfect crystallographic samples that contain only the high-temperature superconducting phase. "It is a materials science problem. Cuprates can have up to 50 atoms per unit cell and the elements can form hundreds of different compounds, likely resulting in a mixture of different phases," said Bozovic. 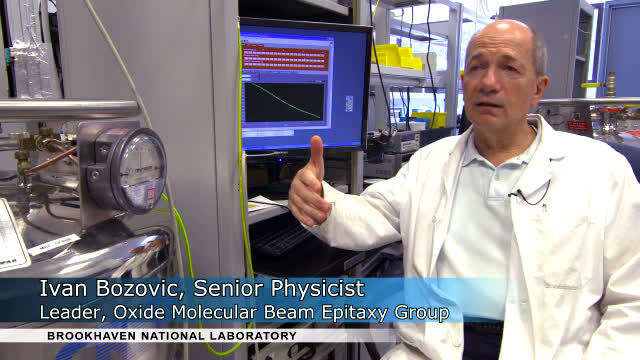 That's why Bozovic and his research team grew their more than 2,500 LSCO samples by using a custom-designed molecular beam epitaxy system that places single atoms onto a substrate, layer by layer. This system is equipped with advanced surface-science tools, such as those for absorption spectroscopy and electron diffraction, that provide real-time information about the surface morphology, thickness, chemical composition, and crystal structure of the resulting thin films. "Monitoring these characteristics ensures there aren't any irregular geometries, defects, or precipitates from secondary phases in our samples," Bozovic explained. In engineering the LSCO films, Bozovic chemically added strontium atoms, which produce mobile electrons that pair up in the copper-oxide layers where superconductivity occurs. This "doping" process allows LSCO and other cuprates—normally insulating materials—to become superconducting. For this study, Bozovic added strontium in amounts beyond the doping level required to induce superconductivity. Earlier studies on this "overdoping" had indicated that the density of electron pairs decreases as the doping concentration is increased. Scientists had tried to explain this surprising experimental finding by attributing it to different electronic orders competing with superconductivity, or electron pair breaking caused by impurities or disorder in the lattice. For example, they had thought that geometrical defects, such as displaced or missing atoms, could be at play. To test these explanations, Bozovic and his team measured the magnetic and electronic properties of their engineered LSCO films. They used a technique called mutual inductance to determine the magnetic penetration depth (the distance a magnetic field transmits through a superconductor), which indicates the density of electron pairs. Their measurements established a precise linear relationship between the critical temperature and electron pair density: both continue to decrease as more dopant is added, until no electrons pair up at all, while the critical temperature drops to near-zero Kelvin (minus 459 degrees Fahrenheit). According to the standard understanding of metals and conventional superconductors, this result is unexpected because LSCO becomes more metallic the more it is overdoped. "Disorder, phase separation, or electron pair breaking would have the reverse effect by introducing scattering that impedes the flow of electrons, thus making the material more resistive, i.e. less metallic," said Bozovic. If Bozovic's team is correct that critical temperature is controlled by electron pair density, then it seems that small, local pairs of electrons are behind the high temperature at which cuprates become superconducting. Previous experiments have established that the size of electron pairs is much smaller in cuprates than in conventional superconductors, whose pairs are so large that they overlap. Understanding what interaction makes the electron pairs so small in cuprates is the next step in the quest to solve the mystery of high-temperature superconductivity. This makes total sense and I love how they highlight every step they took and why. This makes me excited about science again. "... grew their more than 2,500 LSCO samples by using a..."
Yup, beating the problem to death by trying a zillion combinations helps, especially when you're working 'Beyond Theory'. ps: I had my doubts because I could not understand Mr ear-whistles' plausible jargon, but his above posts have settled the issue. Adios. Seems you're on the right track; however, I don't see the causal itemization, frequency distribution, all at a function of current, and temperature, i.e. what moved? But knowing what you're anchoring, not moving, is a good place to start. Cause of heat! "Larger the superfluid density (SF) larger the critical temperature". It seems to me that the binding energy, responsible for condensate, is increasing with temperature. Do we understand the nature of force maintaining this linear relation? Is this SF is exactly similar to BCS-type? What do we mean by "missing electron"? Why pair breaking (mechanism) cannot be held responsible? All-in-all this shows that what we need to be looking for now is the why the electron pairs are so small. Does it have to do with defects in the lattice? Does it have to do with the way the valence electrons are repelling and changing the shape of the molecule? Will tinitus ever be cured of stupidity? We will never know. I don't see how someone could be guided so patiently by Phys1 and still fail to understand what this discovery means. Could this lead to new and bigger questions about things like.. deviation of time? I wonder how does time dilation work on a micro scale, can it be "freezed" or slowed just as it believed to be on a cosmic scale. It's surprising that it hasn't been encountered yet here. So if you were to dope graphene with lithium to make it superconducting, then the graphene would not be brittle? I checked, and it isn't. Not bad, Zeph. @mynoob: It is very unlikely that any random new and surprising physical effect is related to your personal pick of mysterious effect. If you wonder about relativistic effects in conductors, sure, that happens. Magnetism is the classical example of a low-velocity relativistic effect of moving charges. In some semiconductor devices you can produce relativistic "hot" electrons, that temporarily moves at a significant fraction of the universal speed limit (light speed in vacuum). The color of gold is due to a relativistic effect among its valence electrons. Et cetera. "Holes" are not physical holes, but electron orbitals that are unpopulated in a material where most atoms have them. The usual hole production mechanism is heat. Dopants can also be used, yes. When I read such descriptions, it is obvious they stem from an over eager attempt of pattern search. It underlies physical intuition, but when it is guided by a fundamental lack of understanding of the issues it just confuses. "In my field, we all get them: the emails from amateur physicists who are convinced that they have solved a big problem, normally without understanding the problem in the first place. Like many of my colleagues, I would reply with advice, references and lecture notes. And, like my colleagues, I noticed that the effort was futile. The gap was too large; these were people who lacked even the basic knowledge to work in the area they wanted to contribute to. With a feeling of guilt, I stopped replying." "One or two seemed miffed that I didn't immediately exclaim: 'Genius! ', but most of my callers realised that they can't contribute to a field without meeting today's quality standard. Then again, I hear only from those willing to invest in advancing their education to begin with. After our first conversation, they often book another appointment. One of them might even publish a paper soon. Not a proposal for a theory of everything, mind you, but a new way to look at a known effect. A first step on a long journey. I haven't learned any new physics in these conversations, but I have learned a great deal about science communication. My clients almost exclusively get their information from the popular science media. Often, they get something utterly wrong in the process." This is the kind of second rate science we get from scientific teams without the diversity of Muslim, LGBT, Hispanic and African American members. Hopefully a new progressive administration administration will implement science affirmative action quotas and a non discriminatory restroom policy so that science can research Unified EBT Theory and interstellar low income housing. I don't understand, how did you actually checked the brittleness of graphene after doping. How is it possible, when the exclusion principle says, no fermion can sit at the place of another one? Re: graphene not brittle with Li, I still can't find anything to directly support the assertion, sorry about that. For not to violate the exclusion principle in superconductor condensate, the fermions must change into a bosons, so that their wave function can overlap. How they will do it? They form pairs (where the electrons in each pair have opposite spin so there is no violation of the exclusion principle). So the composite pair will then obey Bose-Einstein statistics instead of Fermi-Dirac statistics in the same way that atoms do, based on their having either an odd number of protons/neutrons in the nucleus (in which case the atom will obey Fermi-Dirac statistics) or having an even number of particles (in which case the atom will obey Bose-Einstein statistics). Nope, the atoms in boson condensate don't form pairs. Any other ideas? The quarks in every atom are fermions, yet the composite particles (the nuclei of atoms) can and do behave like bosons (with an even number of constituents which gives the atom integer spin), even though they're composed entirely of fermions, without having to pair with each other. How is that even an "idea"? How is it not what's simply observed to occur? This is the kind of second rate science we get from scientific teams without the diversity of Muslim, LGBT, Hispanic and African American members. @tinnitus: Hadrons like baryons do not break the exclusion principle as the fermions are held together over some (for them) relatively large volume volume, and have different quantum numbers for the exposed "valence" constituents. [ https://en.wikipe...i/Hadron ] Though they may be so crowded that protons and neutrons mass are mostly relativistic, from the kinetic energy of all its constituents quarks and gluons. So when they form condensates, they have already nicely summed up boson #'s. OK, so no pairs. How the fermions (aka cesium atoms) change into a boson condensate? What must happen during it and how? The only thing that has to happen is for the temperature of the sample to be cooled down sufficiently to allow the thermal De Brogelie wavelength of the atoms (regarded as the uncertainty in their position due to thermal momentum) to increase in length until it becomes comparable to the distance between the atoms [edit - as you pointed out, sort of] – at that point a Bose-Einstein condensate forms; the individual atoms become indistinguishable from one another with respect to their individual wave nature, as their quantum mechanical wavepackets overlap (in a simple description), they all occupy the same quantum mechanical state (given by a single-particle, ground-state wavefunction), and the cloud of atoms becomes coherent. You can't expect to get a full course on Bose-Einstein condensation on PO. I feel like I'm getting one just trying to answer his questions. I got the above answer from Making, probing and understanding Bose-Einstein condensates. A lot of fascinating phenomena in macroscopic quantum mechanics, that's for sure. Ah, that is different from asking about composites of baryons (hadrons) like atom BEC. Well, no, if I remember correctly low-T electron pair superconductors has a bandgap suggesting that there was a condensation of carriers, akin to BEC. Instead they found the BCS electron pair mechanism. Now you can also understand, why the size of he size of electron pairs is much smaller in cuprates than in conventional superconductors, whose pairs are so large that they overlap. Here you manage to use and abandon BCS theory at once. Remember, BCS theory applies to low-T superconductors. Cuprates has a new mechanism (of localized carrier pairs), which the current research gives info on. What the available explanations of two findings have in common? That the conditions required for a Bose-Einstein condensate to form have been met – the motion of the particles is slow enough and the distance between them is short enough for the particles to convert, en masse, to the lowest energy state possible. Is that the idea? Okay, well, it's the inference of particle speed and [condensed] state that Prins specifically elucidated in his paper (here), by recognizing that the conditions responsible for the observed flow of current could only be explained in the context of superconductivity and Bose-Einstein condensate, that seems to be the main idea regarding how to make room-temperature/ambient-pressure superconductors. And according to the superconductors.org site you linked to, "Ultraconductor" isn't a theory; it's, sadly, a trademark™. And you wonder why there's been no confirmation (or falsification) on all the reports of alleged success in the field for over a decade (Wiki: Room-temperature superconductor). So do I.